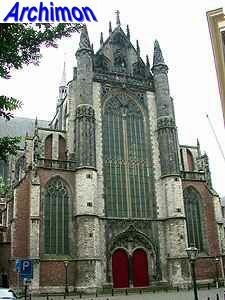 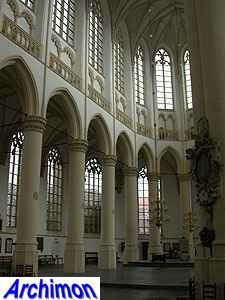 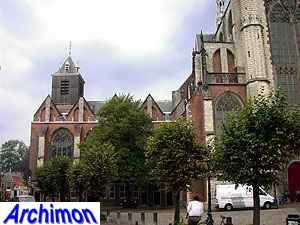 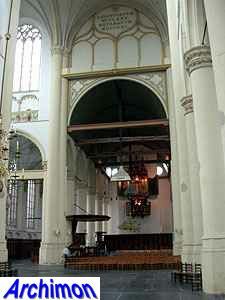 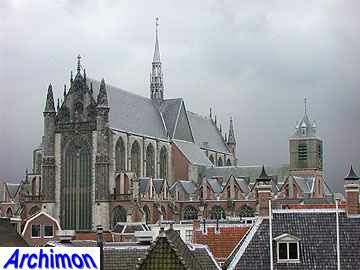 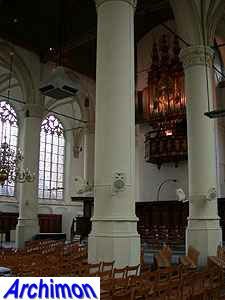 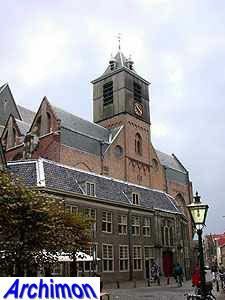 The Hooglandse kerk or St. Pancras is an unfinished Gothic church with a few remnants of its Romanesque predecessor. 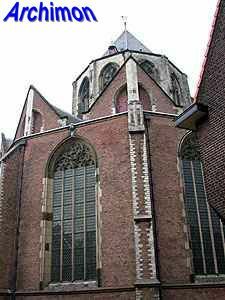 The first St. Pancras was build from wood in 1315, but this building was soon replaced by a stone one, which itself was to make place for a much bigger, Gothic church after a chapter of 24 canons had been assigned to the church in 1366. 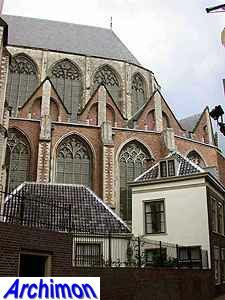 Construction of this new church took place from 1377 until the mid-16th century, when work stopped altogether. 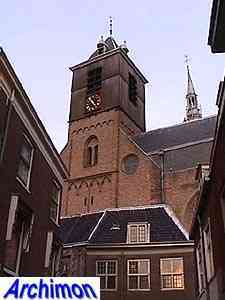 The church fell in protestant hands in 1572. 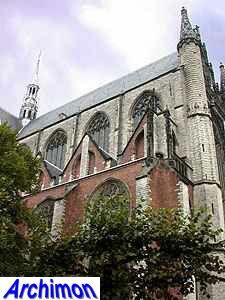 The only parts completed are the choir and the transept. 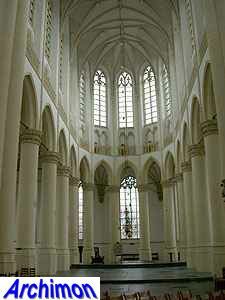 The nave was only partially completed, with just the side-aisles but no clerestory. 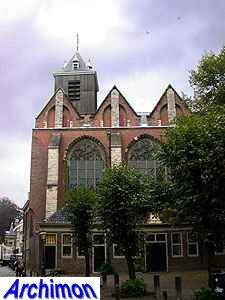 The front and tower of the old Romanesque church were never replaced. 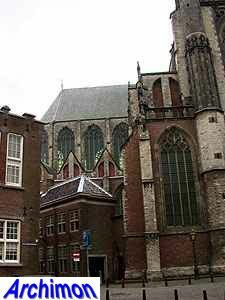 Foundations found a bit to the west of the tower indicate that the nave was planned to be longer than it is now. 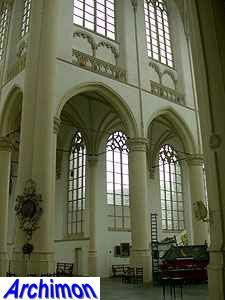 The church was intended to have stone vaults. 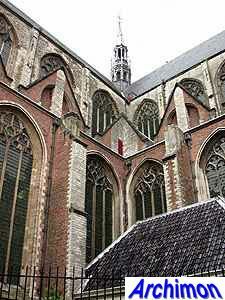 Traces of the necessary flying buttresses are evident in the gables of the nave. 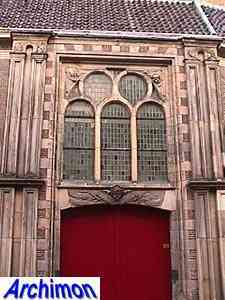 During the iconoclastic riots of 1566 most of the archives of the church were destroyed, leaving little evidence of which architects were involved in the construction of this church. 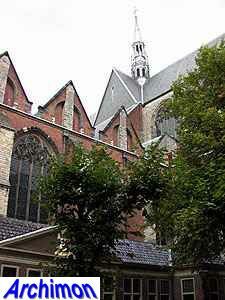 Names of those that are likely to have been involved are those of Cornelis de Wael, Everaert Spoorwater and Rombout II Keldermans. 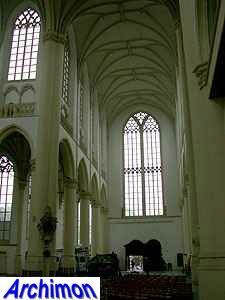 This picture illustrates how much work was still left to be done to complete the church. 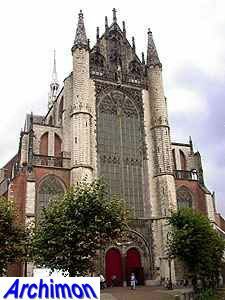 The nave was only half finished while the small Romanesque tower was never replaced and is today dwarfed by the size of the transept.